This entry was posted in Carlton Car, King Car, Service Cost and Quality, St. Clair Car, Transit, Waterfront. Bookmark the permalink. I see that the south end looping change for 97 and 320 is no longer on the list of temporary changes; it was changed because of the Front Street construction years ago and should’ve been back to normal by now. Any word on if this is quietly become permanent? First of all, every extension or new system involves changes on how the whole system operates. And, like it or not, people want to go downtown to work and for other reasons. Actually, people in Thornhill like Josh want stops closer to them so they too can go downtown for work and for other reasons. So its not like the Richmond Hill extension would be “outside of Downtown”. Secondly, without first building another line from the downtown to somewhere else in the current system to relieve pressure on the Yonge and Bloor lines, it won’t be possible for anybody south of Thornhill to get on a subway car. Is this REALLY what the good people of Thornhill want? That they get a couple of subway stops and the people of the area who live South of Steeles get shafted? Build a relief line that serves ALL of us who take the TTC across its system, including people in Thornhill who currently can’t get seats on the Yonge subway at FInch in the morning rush hour. Cause, that’s the thing, just because you build an extension doesn’t mean there is suddenly more seats available. Only once capacity has been relieved on the Yonge line, build the extension on Yonge north. Otherwise, we are building subway stops only for people in Thornhill, and I am sorry, but Thornhill/Richmond Hill are not THAT much of a priority. Steve: Like the good people of Scarborough, the folks in Thornhill are being told by some of their politicians that added subway capacity is just around the corner thanks to lad shifted to the TYSSE and to the new trains running on closer headways. In this, they have been encouraged by unrealistic claims made by the TTC. Although the TTC has scaled back expectations a bit, many of the pols are still using the old songbook from the days when the Yonge line had huge “room” for growth and nobody in their right mind would talk about the DRL. This is one of many ways in which Toronto has been badly served by TTC “planning”, not to mention GO Transit foot-dragging and the built in bias that folks in York Region expect to pay one TTC token (not some mythical “integrated” fare) on a new subway. The TTC is capacity-constrained due to garage space, but what about YRT and the other surrounding transit agencies? Is there any capacity for the TTC to contract in service along the borders (YRT in North York and north Scarborough, MiWay in Etobicoke, Durham Region Transit for east Scarborough)? Would it be a realistically priced alternative to leasing temporary garage space if Council were willing to pay? STANDING OVATION to that. I will be willing to pay twice as much for YRT/VIVA and/or DRT or DRT Pulse service in Scarborough. I am just tired of waiting for TTC buses only to have three, four, five, six, or even seven show up at the same time. Seven TTC buses showing up at the same time is the highest that I saw two different times. How do seven TTC buses manage to show up at the same time? I have never seen that in any other city in Canada nor abroad. This is one of many ways in which Toronto has been badly served by TTC “planning” … and the built in bias that folks in York Region expect to pay one TTC token (not some mythical “integrated” fare) on a new subway. Steve, the bias is not in our people from York region but your own mind for you know full well that the TTC tokens will be obsolete by the time the heavily delayed and over budget TTC bungled subway extension begins operating in Ontario’s Rising Star. Steve: The Richmond Hill and Vaughan extensions have been on the books for a long time, and a common theme has been the single “token” fare to downtown. You may like to rewrite political history, but that doesn’t make it true. …so I wish that DRT Pulse buses also went from UTSC to Scarborough Town Centre. Furthermore, I wish that there was a YRT or VIVA bus to Scarborough Town Centre as we are held further hostage by the TTC as we travel on McCowan from Scarborough Town Centre to York Region. From when YRT first announced the routes for the then-upcoming start of VIVA service in September 2005, the Purple route was planned to be extended from its initial eastern terminus of McCowan to serve the soon-to-be-built Cornell development, where there would be a connection with DRT. Cornell is now an established community, and Purple was extended to Markham Road and then to the M-S Hospital. After 10.5 years, there’s still no extension to Cornell and no DRT connection. Is there any capacity for the TTC to contract in service along the borders (YRT in North York and north Scarborough, MiWay in Etobicoke, Durham Region Transit for east Scarborough)? Never mind contracting out, which is pretty much a non-starter, but if there was proper fare integration, then anyone needing to catch a bus on Don Mills (and soon, Victoria Park) for travel between Steeles and Don Mills Subway station could just catch the next bus coming along, regardless of its livery. The latent capacity on those YRT buses could free up a bus or two for other services. Heck, on Don Mills, a little more service between Don Mills station and Pape station could be provided if this was done. It took a whole lot of arm twisting to get the agreement in place that allows people to travel on VIVA Orange between Downsview and York U. So much trouble, that by the time it was implemented, the VIVA buses were serving the campus in a physically different location that does not facilitate anyone needing to get to Downsview to just catch the next bus, TTC or VIVA. At least it is this easy for those going the other direction. I will be willing to pay twice as much for YRT/VIVA and/or DRT or DRT Pulse service in Scarborough. Slight problem Jeff.. those buses you would be willing to pay extra for won’t stop and pick people up heading into Toronto or drop them off when heading out of Toronto. It’s part of an agreement making the TTC the sole transit provider in Toronto. I take Miway from Square One to Islington daily and it is the same thing. I can board buses heading out of Toronto at Islington but I cannot get off the same bus at Aukland Rd (outside Kipling Stn). If I am coming in from Square One, unless someone requests a stop the buses express to Islington Station once they hit Mill St.
Only TTC buses can provide transit services in Toronto. DRT, YRT and Viva are legally prohibited from providing competing transit services within Toronto. @ Richard White – I do that all the time i.e. use YRT and MiWay as a substitute for short trips within Toronto. I just tell the driver that I am having an emergency or I left something at the stop I no boarded or even tell the driver that if he fails to stop, then I am calling the police and telling them that I have been abducted as forcing someone to stay in a vehicle against their will is an example of abduction. So much so that drivers don’t even bother arguing with me and the bottom line is that I would pay anyone but TTC. I get on the VIVA at Steeles to Finch all the time where I allegedly enter the subway for free all the time though I don’t know who is making the allegation as I have never been caught. VIVA always opens it’s doors at Steeles even southbound as there is always someone wanting to get off. So, the TTC monopoly on transit in Toronto is on paper only as a lot of people use VIVA, YRT, GO, MiWay, Zum, DRT Pulse as a substitute all the time and then enter the subways unlawfully and get a transfer once in. Anyone who threatens to have a bus driver charged with abduction because they want to cheat the system should have the police called on them as there is something woefully wrong with all that. There is nothing saying that the driver MUST let you off anywhere but the designated drop off points in Toronto. They just feel bad so ya. They could easily say double back when you get to the station or call the police on you because they feel threatened. As for everything else you mentioned, you just admitted to fare evasion so there’s that. There is a reason nobody pulls the stunts you do. Steve: I had mixed thoughts about letting that comment through in the first place. I use GO from Milliken to Union and yes i am from south of Steeles and there goes TTC monopoly down the drain. Yes, I pay more but I don’t have to wait half an hour to have four TTC buses show up at the same time and use filthy TTC stations. Metrolinx does a far better job than the TTC and I am willing to pay the premium to use their services as not everyone in Scarborough is as poor as Steve is always crying/claiming and I happen to be a wealthy happily married Scarborough man with four beautiful children. Steve: I am not crying about the poor in Scarborough — they do a very good job of this themselves, and the idea of having to pay more for transit is something that I hear about regularly from that quarter. I too am well-off, but that does not mean I can’t talk about issues that affect those who are not. You may be able to afford a premium service, but not everyone in Scarborough (or Toronto) is that well off. I noticed today that a few metres of track at the new Distillery loop on Cherry Street had its top layer of concrete removed exposing the rails. Perhaps the rails had an electrical bonding problem to be fixed? Here is a photo of a streetcar on Sumach at King from April 27. TTC crew were running the car backwards and forwards through the west-to-south special work to test the track. Long time lurker, first time poster. I really enjoy your posts here Steve! Broadview is going to be really fun this summer. In addition to the bus terminal roadway closure, there will be resurfacing work being done along Broadview from Danforth to O’Connor until September. Preparatory work has already started on that project. Interesting though that the 8 Broadview will be getting a bus added to provide 20 minute service. A level of service that hasn’t been seen since the dark days of 1996. And it is about time they removed that Sunday stop NB at Hillside, which hasn’t served a church in several years. Would anyone happen to know if any of the bus schedules have also been adjusted to reflect the road work on Broadview as well? Looking at the changes, I have a feeling that may have been looked over. Steve: The service memo only mentions the arrangements at Broadview Station. Depending on the amount of recovery time that was already in the schedule, some periods don’t see any change, while others get more running time to adjust. As for the road work on Broadview, this will be repairs to the many places where there were pavement and sidewalk cuts for the water main work, not a complete rebuild of the street. The paving work will be annoying, but I’m not sure it will occupy the street as severely as the water main upgrade. We shall see. I really hope that someone has the good sense to get rid of the cab stand outside of Broadview Station and make the area no-stopping for the duration of the bus diversion. It will be amusing watching the buses queue trying to get around the corner at Broadview/Danforth but stuck behind the lineup of streetcars that won’t fit in the loop because they have too much running time. Steve, the cab stand is there to stay if you don’t like cabs, them by all means take Uber which is cheaper and the Uber drivers drive a lot more safely. Steve: I am talking about traffic congestion during a period of construction and temporary on street stops. Maybe if you were less concerned with plugging Uber and more with transit operations, you would know that blocking out curb lane use is not uncommon, although usually for parking. Cab stands should not be immune from such needs. With regards to all the talk about fare evasion, here is a lawful way to evade fares: just show your Presto Card when there is a bus serving a streetcar route and also at stations where Presto is out of service half the time. I have saved hundreds of dollars doing this and it’s perfectly legal. Steve: This really is not a permanent condition, but an obvious side-effect of a transitional arrangement. You won’t be able to get on a bus without a Presto machine fairly soon. As for non-working machines, yes, I have seen them, but they are a minority on the system as a whole. Enjoy the free rides while they last. Lawful fare evasion is simple with the POP and on-board PRESTO. Simply tap your card if you see an inspector and since most of the time they don’t check fares, most of the time you don’t have to pay. I would really like to know what kind of fare evasion is “lawful”. Back in 1981, I shot a film with a few friends on the TTC and I obtained a property permit at TTC’s head office. When we were entering, I expected to have to pay the fare for everyone in the cast and crew, but we were waved through, so I suppose that may constitute “lawful” fare evasion. As for Aneel’s suggestion, I would like to see that tried when the fare inspectors are off board checking people as they alight when the chance to tap is not easily accomplished. They could also look into disabling the Presto readers for a couple of minutes when inspectors board, after giving those who just boarded a chance to tap first. I would really like to know what kind of fare evasion is “lawful”. There are plenty of lawful ways like when a collector is not available or someone left the manual handicapped gates open. The list is endless and if you are smart, then any payment you make to the TTC is voluntary and not mandatory. This is a ridiculous statement. There is no such thing as a LAWFUL way to avoid payment. There are only ways to avoid paying what you owe if you are dishonest. There is such a thing as the “Honour system” . Ever hear of it? Sneaking into a subway station by avoiding the legal entrance does not make it legal. Because the station collector goes to the toilet it is still UNLAWFUL to enter without paying Get caught, loose your Metropass or get a $35 fine. Hello Steve, another long-time-lurker, first-time-poster here. I am thankful that most Torontonians are not so self-centred. While waiting for a friend last week at Ossington Station, I watched the collector booth with interest while it was closed for a crew change. Virtually everyone I saw swiped their passes or paid with cash or tokens exactly as they would with a collector. They know, as the three of you do not, that society cannot exist with freeloaders alone. Steve, it is your blog and you may respond or not as you wish, but I could not in good conscience let those comments go by unchallenged. Steve: I had hoped that this thread would die out of its own accord, but this will be the end of it. There have been various comments along this line which, I suspect, are all originating from the same person whose glee seems to be not paying their fare and crowing about his success. A more productive debate would be advocacy for a system like time-based fares, and more generally purchase of travel in blocks via passes or their equivalent. One of the most annoying features of transit, and a barrier to its use by some, is the sense of being nickled-and-dimed to death in a way that encourages fare evasion. That sure applies to the TTC! but if there was proper fare integration, then anyone needing to catch a bus on Don Mills (and soon, Victoria Park) for travel between Steeles and Don Mills Subway station could just catch the next bus coming along, regardless of its livery. This brings up an interesting issue. If fares are equalized and there are overlapping service, who gets what portion of the fares? That is going to dictate who is willing to run more competing service. For example, if it’s an even split, it might turn out as a bad deal for either side to run more buses and we see cross-border service suffering. There are many other permutations for things to go poorly. Ideally, the ratio of the fares collected ought to be proportional to the service run, and with a system like Presto, this could be fine-tuned to the ratio of how many riders use which buses. While it is conceivable that cross-border service could suffer, I highly doubt that would happen as cross-border services do not exist in a vacuum. The connectivity with routes, and the sheer length of the run, within the home territory of the operator will have a strong effect on how much service needs to be run. By that, I mean that an individual needing to get from point A to point B in different operator regions will likely choose the service that is the better of the two for their situation. For instance, a YRT bus that can be boarded a block or two from home that takes one to Don Mills subway station with a one-seat ride might be a better choice than taking a YRT route that connects with a TTC route to that same subway station. Meanwhile, that person’s neighbour might find the YRT route that connects with the TTC route is better because they need to get to Don Mills and Lawrence. 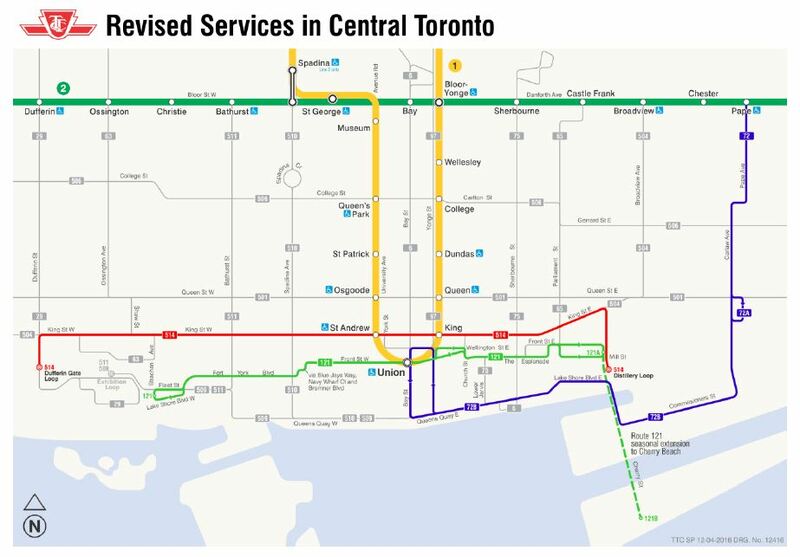 Steve: It is also important to remember that some of the existing overlaps are a direct result of the lack of fare integration, as well as the relative convenience for York Region of contracting some services to the TTC. The overlaps might disappear once the fare problems are sorted out. The TTC will be replacing streetcars on the “511 Bathurst” route with shuttle buses, just in time for track work at the intersection of Bathurst and College Streets to begin. The condition of the concrete around the streetcar tracks has steadily deteriorated over the last decade, since this route ini its entirety was paved (early spring 2005). When this work is completed, streetcars will make their return to the “511 Bathurst” route, and will run from Bathurst Station down to the Exhibition loop – which is temporary – so that people heading to the Canadian National Exhibition in late summer don’t need to transfer to shuttle buses. The shuttle bus service on Fleet Street returns after Labour Day weekend. The new low-floor Flexity streetcars will start to run on this route – 511 Bathurst – at sometime this year. Am I seeing this right? 21B will run every 15 minutes in the afternoon rush? TTC is going to take 2 buses off the route and only run 3 buses with 45 minutes round trip. Cause now there’s 5 buses on the route every 9 minutes with a 45 minute round trip. I can see people complaining about the frequency jumping up to every 15 minutes. Steve: Hmmm. This doesn’t look right. The service notice clearly says that it is going to a 15 minute headway but that only 1 bus, not 2, will be removed. I will check into this. YRT/VIVA overlaps exist because TTC bus drivers run on their own schedule and it is very common for six or seven TTC buses to show up at the same time during rush hour which (i.e. bunching) is not the case for subway trains and that is why we don’t have YRT/VIVA buses running in subway rich Downtown. I find it amusing how subway drivers and YRT/VIVA can manage to avoid bunching without any supervision but buses and streetcars manage to show up multiple ones at the same time even at a time of little traffic and no construction/disruption. Huh? YRT/Viva/MiWay generally only run into Toronto to the nearest subway station. The subway has supervision. YRT/Viva calls theirs “Transit Management Systems (TMS)”. It’s amusing to think that somehow transit operators can manage to avoid bunching without active moderation. The TTC can learn how to do it better from YRT, but you need to do something. Steve: This comment has been edited to remove an incomplete link to YRT/Viva. On the YRT/VIVA buses, there is a handout hanging called MyTransit. It is similar to the old TTC Headlights that used to be available on all vehicles and loaded with TTC info. This current YRT one has fare changes, VIVA info, Newmarket bus terminal restructure and on the final page, service changes. It lists the routes where there are changes and you have to go on line to find out the detailed information. 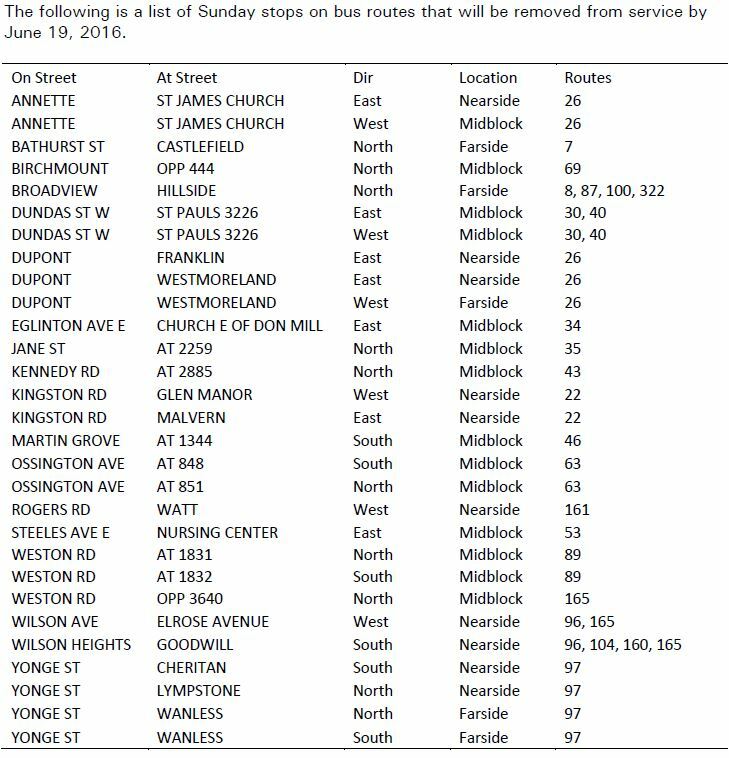 The interesting one (besides the 24 Woodbine) is 107 B/C/D Keele North. On the site, it has that the route will be restructured to service Interchange Way (Jane and 7) effective June 19. There is no information about this on the TTC site and this seems to be a little out of the way for the route. Have you heard anything or is it just the right side doesn’t know what the left side is doing (TTC/YRT)?? Thank you for everything you inform us about on this site!!! Steve: I have not seen anything about this in the TTC service memos or announcements. Sorry Steve, found it……YRT goofed but TTC didn’t have the info until you checked under the individual routes…….35 Jane not 107 Keele North is being restructured north of Steeles . This past weekend, the TTC replaced streetcars on the “511 Bathurst” route with shuttle buses, and they were on their regular routing, straight down Bathurst Streets, then westward on Fleet Street to Exhibition Place. Today, they started detouring, ahead of the start date of construction with “Detour on Route” in addition to “511 Bathurst”. Unlike streetcars (which need to use track), shuttle buses could use both bus and streetcar routes when detouring around construction zones. Do you remember the Queens Quay West streetcar track construction (from 2012 through 2014)? The TTC replace streetcars on the “509 Harbourfront” route with shuttle buses, which first travelled both ways on Queens Quay the first few months, then later diverted via Lakeshore Boulevard. These shuttle buses will stay on this route until Saturday, July 30 (or until construction is complete). People heading to the Taste of Toronto at Fort York this upcoming weekend, and the Honda Indy next month, should allow themselve more time to get to their destination. Although the streetcartrack construction at Bathurst and College streets is completed ahead of schedule, the TTC continues to run shuttle buses on its “511 Bathurst” route. These buses are no longer making the detour via Harbord Street, Spadina Avenue, and Dundas Street West, which have been doing from June 21 through to July 10. Is there still work which needs to be done before streetcars return to the “511 Bathurst” route? If yes, then describe in detail. Steve: It’s a question of schedule periods. The next change is on July 31, and so the buses will run until then (they come from a completely different place, with different operators, than the streetcars). For the same reason, buses will operate on 506 Carlton until the Labour Day weekend because that’s the next schedule change, even if College Street is passable before then. Today, I was returning home from volunteering at Valleyview Residence in North York. On the way there, I rode one of the older trains – the old “sweat boxes” – on the Bloor-Danforth subway. On the way home, however, I rode one of the new Toronto Rockets. Oh, whatta difference, especially in this heat wave which just began. This upcoming weekend (July 23-24) will be the last full one that shuttle buses will be running on the “511 Bathurst” route; next weekend, streetcars return to the route and will run the full length, from Bathurst Station to the Exhibition loop (temporarily), in time for the CNE period. Steve: Of course, none of the trains on BD should be “sweat boxes” but for lack of maintenance.